Little-known charity, SMA Australia, an organisation that works to provide care for Australians living with spinal muscular atrophy (SMA), a fatal and debilitating muscle disease, which is the leading cause of death for infants under the age of 2-years-old, was recognised for their life changing advocacy efforts at the Holt Australia Day Awards on Australia Day at Hampton Park in Melbourne. SMA Australia, who is Australia’s peak body for those living with SMA, provides education, advocacy, proactive advice and support for those affected. SMA Australia were instrumental in advocating for the life-saving drug, Spinraza, to be made affordable via the Pharmaceutical Benefits Scheme (PBAC) in May 2018. Their advocacy efforts enabled the PBAC to recommend the treatment for those living with Type 1, 2 and 3A under the age of 19-years-old. Whilst adults with SMA missed out on the treatment, SMA Australia CEO, Julie Cini, is determined to make sure that all those living with SMA in Australia can have access to treatments if they choose. “I will not stop fighting until I achieve this goal,” Julie, who lost two children – Montanna and Zarlee – to the disease, said. “SMA is a deadly and debilitating disease, but in the year 2019 why shouldn’t treatments for diseases be accessible to those who want a good quality-of-life?” Julie said. SMA is a rare disease and most families have never heard of the disease before they were diagnosed. “The more people that we can educate to know about the signs and symptoms of the disease the better,” Julie added. “Although we have some great new pilot studies like pre-conception screening (dubbed ‘Mackenzie’s Mission’), and a newborn screening pilot in New South Wales and the ACT, I believe more education of maternal child health nurses and GPs is needed to ensure a quicker diagnosis, which in turn faster access to treatments like Spinraza” Julie added. “The Federal Government has done an amazing job already for Australians living with SMA under 19-years-old, but we need to make sure that those over 19 can gain access to treatment quicker. We will continue to work with the PBAC to ensure the access to adults with SMA. “SMA Australia is continuing to add people to their database which we believe is the largest database in Australia of people living with SMA, and hope that the data will inform the board of the PBS to make a favourable decision to include Spinraza for adults living with the disease. “Receiving this award is a boost to our confidence, that someone outside our community recognises out hard work. 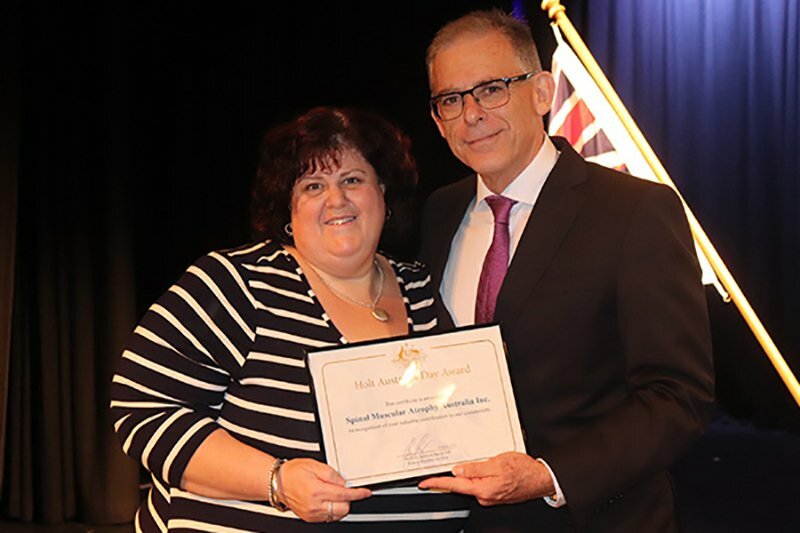 We’re all very humbled to accept this award but our focus of all those who chose to access treatment in Australia stays the same for those living with SMA,” Julie added.